A random assortment of things I am swooning over today. I want to have a party & use sparklers. image source unknown, please message if you know it! If I design a house I 'd create a secret passage door. It is so funny ! have just offered to make a cake for the weekend...and for 30 seconds thought I might try the shaded one. What on earth was I thinking? i struggle to make a regular sponge! I think it might be 'macaron' and not 'macaroon.' Macaroons (with two o's) tend to be the coconut meringue cookie, while a French macaron is the almond meringue sandwich cookie. Oh these pictures are lovely! I'm especially liking the macaron chart and those pretty cupcakes! That outdoor area is so cool. Some people are just so creative! I love the twine dispensers too. Those cupcakes are making me want to have a party! Now you got me swooning too! My sister is having sparklers at her wedding next weekend...I'll light one for you! I love the adventrue kit! How awesome would it be to receive one in the mail! I love that little adventure kit too, but I can't seem to click on the link? i love these!! especially the sparklers and the pink layer cake!! 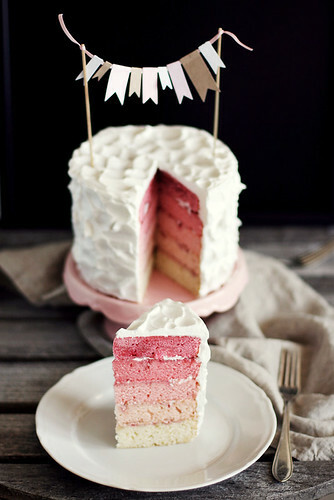 i've been meaning to bake a colored layer cake for so long and i've seen so many photos of them, but this one is the prettiest! Love the cupcakes! 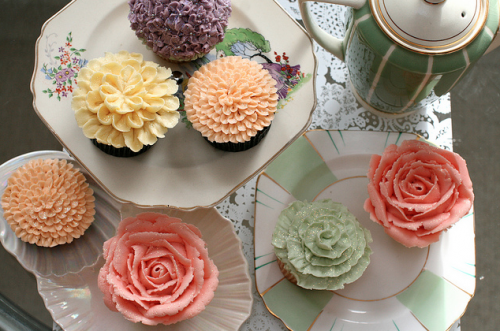 Makes me want to dress up and have a tea party! Swoon indeed! So many goodies over here. I love the door, the cupcakes, that cake, and those macarons! love the secret passageway...and i can't wait for summer sparklers! the hammock and that backyard are perfection! i would love to spend a day just lounging out there! what a cute backyard!!! i would want one like that, too. Love these pictures! The secret door is amazing. I love sparklers! So many wonderful things! I say "it is what it is" all the time! That twine dispenser is GENIOUS! That secret passage door is so beautiful and possibly the coolest thing you can have in a house. I love your Blog. It has such a wonderful collection of different things.